In an article in Wednesday’s paper, I wrote about an environmental law firm that persuaded thousands of San Francisco commuters to use their smartphones’ Foursquare application to “check in” at its advertisements in subway stations and raise money to save the American pika, a critter that may be threatened by climate change. The nonprofit law firm, Earthjustice, scored a victory this week when a San Francisco judge ordered the California Fish and Game Commission to reconsider a decision to deny state endangered species protection to the pika. 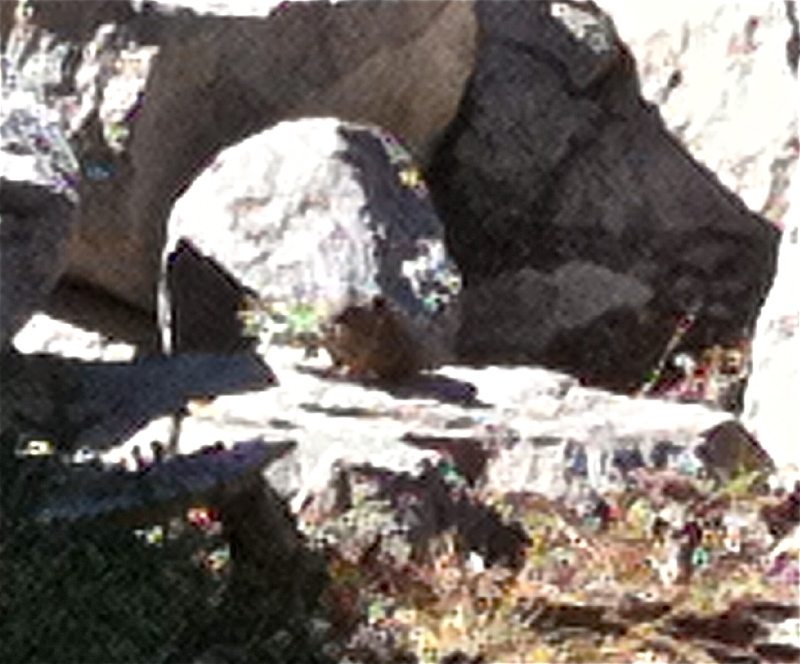 A relative of the rabbit, the pika lives on the rocky slopes of alpine ranges in California and throughout the West. Even small increases in temperature prove fatal to the pika, which does not hibernate and maintains a high body heat to survive frigid winters. As temperatures rise in mountainous regions, some scientists have found that pika populations either have vanished at lower elevations or moved to higher ground. The pint-sized mammal is also at risk from melting snow packs, which it relies on to insulate its burrows during long winters. 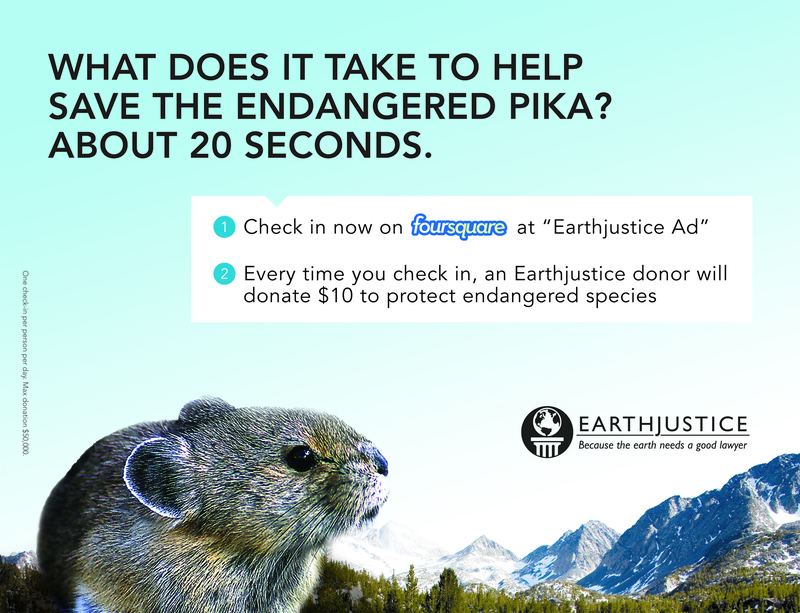 Earthjustice represents the Center for Biological Diversity in its efforts to have the pika listed as a protected species under state and federal law. After initially finding that a listing may be warranted for the pika, the United States Fish and Wildlife Service in February concluded that the species could adapt to climate change. In California, meanwhile, Earthjustice has been enmeshed in a three-year fight with the state Fish and Game Commission. The commission has twice rejected consideration of the Center for Biological Diversity’s petition to list the pika as a threatened species. “The record in this case unequivocally demonstrates that the petition failed to include sufficient, if any, scientific information about population trend, population abundance, range, distribution, and degree and immediacy of threat to the pika throughout all or a significant portion of its range in California,” Cecilia L. Dennis, a California deputy attorney general, wrote in a motion filed Sept. 1 that opposed the environmentalists’ effort to re-open the listing proceedings. But Greg Loarie, an attorney with Earthjustice, which is based in Oakland, Calif., argued that the Center for Biological Diversity offered more than ample evidence that a listing might be warranted for the pika, which would lead to a full investigation of the species’ status. In court filings, Mr. Loarie said that the commission failed to properly consider new scientific evidence that his client presented in 2009 after Judge Peter Busch of the San Francisco Superior Court ordered the commission to reconsider the petition on the ground that it had used the wrong legal standard to reach its decision. “As the expert agency charged with protecting California’s wildlife, the commission’s role is to evaluate the substance of the scientific evidence that it receives in support of and against a listing petition,” Mr. Loarie wrote in a brief.